Horehound, White - Marrubium vulgare - Perennial - Medicinal - Bushy plant with pale green wooly leaves veined with white bearing spikes with tufts of small white flowers in summer. 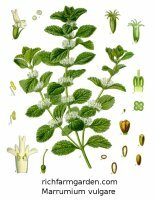 Horehound has been used for centuries to treat colds and sore throats and was used by the ancient Egyptians as an antidote to vegetable poisons. Recognized as an effective expectorant . Full sun; plant height: 18-24in.